WHISKAS cat food is complete and balanced, specially designed to fulfil your cat’s needs at every life stage. At the age of 12 months, your kitten turns adult, and requires a different nutritional needs. This change in nutritional needs will change again when they turn 7. Cats aged 1-6 need lots of playtime and a balanced diet to help them stay lean and healthy. Cats are carnivores while humans omnivores, so cats need two times more protein than us. They also need 41 essential nutrients for optimum health. WHISKAS understands the nutritional needs of cats, and every product is specially designed to be complete and balanced. -Formulated with omega 3 & 6 fats and zinc for a healthy and shiny coat. -Complete with vitamin A and taurine for healthy eyesight. -Filled with proteins from real fish, including fats, vitamins and minerals, so your cat stays active and happy. Both WHISKAS dry and wet food are complete and balanced for your cat’s nutritional needs. However for optimal goodness, we encourage you provide both dry and wet food to your cat. Wet food contains water to ensure healthy urinary tracts, and has fewer calories. The unique kibble shape of WHISKAS dry food helps to clean teeth and gums, ensuring your cat’s oral health. Your cat will surely adore the variety in texture and flavours that you provide to her. WHISKAS understands the natural needs and wants of cats at different life stages. Every product is backed by extensive knowledge and research to ensure your cat grows up happily and healthily. 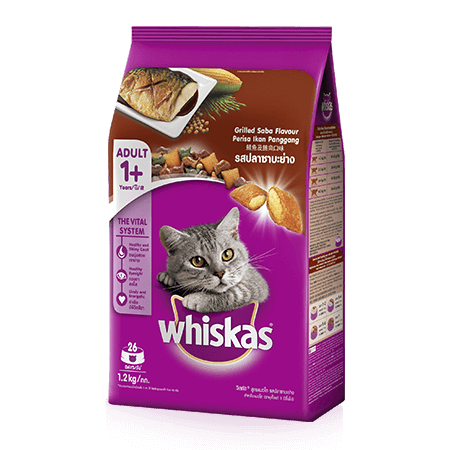 WHISKAS cat food has been designed and tested by WALTHAM, UK, one of the world’s leading institutions in pet food and pet care. It has also passed every cat food test by the Association of American Feed Control Officials (AAFCO), GMP (Good Manufacturing Practice), HACCP (Hazard Analysis and Critical Control Points), and ISO 9001: 2008.